I was too weak to take a deep enough breath to laugh, yet I couldn’t help but smile, cringe and awkwardly chuckle to myself. “This? Am I really meant to drink THIS?” I know picking on hospital food is an easy target as no one expects it to be tasty, and to be totally fair, most of the actual food was not as bad as I expected. There were plenty of somewhat healthy options and they gave me a choice of what to eat instead of just arbitrarily shoving microwave hamburgers and canned peaches in my face. But this was surprising to me, especially given the circumstances. 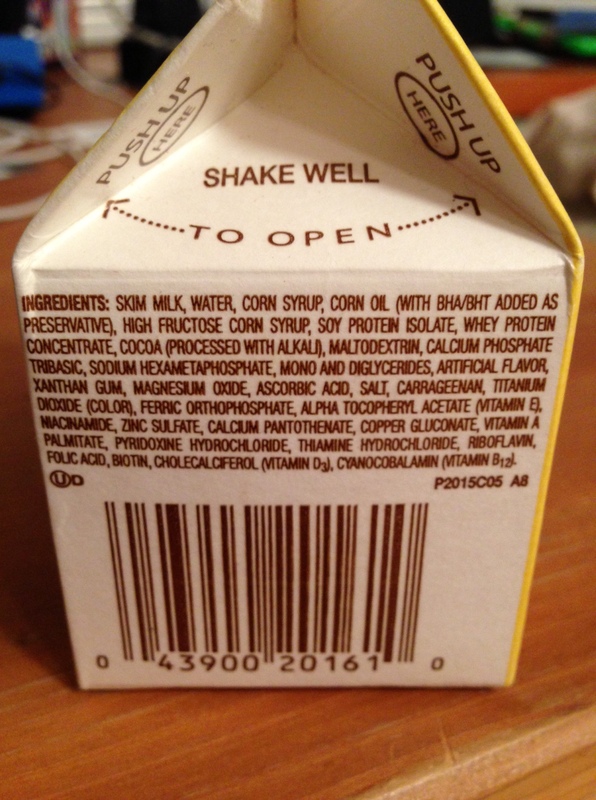 Once I read the ingredient list, I couldn’t help but wonder….Aren’t I in a hospital, where I’m meant to get better? Shouldn’t I be avoiding a bunch of chemicals and synthetic additives? Isn’t it counterintuitive to ingest a bunch of processed artificialness when I’m in such a volatile state and my body only needs what’s essential and healthy? And that’s when I had an epiphanic moment and the reason why I asked my mom not to throw this carton away. I wanted to hang onto it because I knew this moment now would come and I could look back at the sardonic tragedy of this glimpse into our healthcare system. It also seemed strangely comedic that I was being given no less than five different laxatives and medicines to help move things through my body (due to the fact that I was laying in bed for ten days) yet the food I was being served contained probably a quarter of the amount of daily fiber that a normal person would need. Why not ease up on the laxatives and feed me some extra broccoli or kale? Wouldn’t a fruit smoothie replace the need for all that medicine, not to mention that it would taste a lot better than this “fortified” strangeness? I can laugh about this now because these days, I have the fortune of being able to eat a healthy diet of my choosing, but the reality of this paradox in our healthcare system still saddens me. 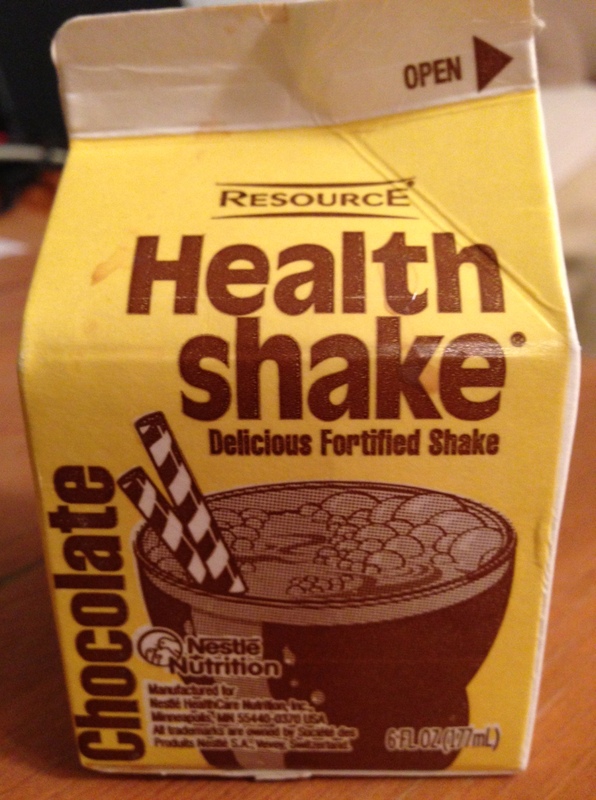 We make all these gains, research and develop incredible technologies that improve the health of many, yet amidst this vast knowledge, hospitals are still serving synthetic chocolate milkshakes with “health” on the front, that look like they’re straight out of the 60’s?! I totally agree. I hope that someone in a position to make a change will see your post and act on it. I couldn’t believe some of the sickly sweet junk on the menu in the private hospital rehab. unit after my lower back surgery, and they (the dietician & nurses) couldn’t get over me bringing my supply of herbal tea, gluten free breakfast cereal etc and then……….asking for green salad, a lemon & olive oil with my lunch. While every other minor spinal surgery patient was laying in bed all day watching tv, I was slowly walking up & down the corridor 6 times (morning, noon & night). I could walk so why not do it. Hippocrates, Galen and all the other ancient Greek physicians would turn over in their graves if they saw what diet, post surgery, was like in many modern hospitals. Hope you are feeling positive and life is improving for you as you continue your healing journey. Common sense is not a high priority in our medical field. Great point here. haha! straight from the 60s, when all consumers were looked at as experiments! Your blogs are inspirational and full of incredible insights about the human condition and the world we live in. I hope you will consider putting them together in a book at some point. I would like to see you get as much exposure for your wisdom as possible, You are often on my mind and I am always sending you my best wishes for your full recovery. Your blog about labeling people based on their disability really hit a chord in me. I agree we should look at the “able” part of the individual and not put limitations on anyone particularly through language that puts someone in a box. Let me know if you would welcome a visitor. As you know, I am a Berkeley person myself. Hi Arash. Yes, hospital nutrition services are not what they should be. Unfortunately many are working on very tight budgets and trying to maximize calorie and protein intake in a time-efficient and cost-effective way that is also low-risk for food-safety problems. Often times these super processed, sugar-sweet drinks are a good way to accomplish these goals. I am glad you are now able to eat the whole-foods diet you need. ON another note, have you considered yoga therapy? It is great that you are in a part of the country where there are so many options . That is ridiculous and appalling, but not surprising. In my perfect world they would use all the grounds on the hospitals to be edible gardens — plenty of low-cost veggies to make sure patients are getting the nutrition they need and a beautiful and interesting place for patients and their families to go when they need to take a break outdoors. Now if only I could think of a non-profit that would be willing to take this project on…. I recently fell performing aerial arts and was so lucky to only have to mend a broken radial bone in my elbow and heel. I found you through Upworthy; your spirit and story inspire me and I love to witness your passion and right mindedness on so many of life’s challenges. I absolutely had the same response while I was in the hospital- so much so I refused to eat what they offered and had my amazing mom bringing me blueberries and kale salads. I couldn’t agree more about finding or putting together a non-profit that would create gardens just like Pinot Ninja talked about; for the patience health and the nurses, doctors and administrators that work in that toxic environment. I just took some to a friend last week who was in the hospital for a raging kidney infection. She was predicted to get out on Sunday, but dang if she wasn’t released on Friday instead. The nurses were always amazed at how well Ron’s recovery from in-patient treatment was. Hospital food never crossed his lips. By the way, how did they expect you to open that fricking container, anyway? Did you know that many years ago, the food at Alta Bates used to be so good that people from the neighborhood would go there purposely for lunch? Hang in. We all love you. I completely agree! This was part of the reason I changed my major after my injury. I saw how important nutrition was in the healing process. Eating well was something I took for granted before I was forced to stay in the hospital for extended times. Friends and family were always bringing me food for the patient refrigerators. I decided I would change my course and become a dietitian in hopes of teaching people the importance of proper nutrition, especially after SCI when our metabolism can completely change. I’m glad you feel the same way that I do. haha..yeah, Xan was in ICU for 40 days…they had him on IV for god knows how long..(.my million dollar idea is to make a healthfood nutrition solution instead of the crap in THAT!) when he finally could eat, even as screwed up as he was he would NOT eat the hospital food (except for bananas, etc)…constant quest to find stuff he would eat…fortunately in LA/Bev HIlls around Cedar’s there were plenty of options..and EVERYONE wanted to bring him stuff so uber healthy smoothies and juice combos, were the order of the day (from great places all nearby), plus pastas, sushi, salads, etc…(from restaurants and Erewon + Whole Foods, etc) but then he got transferred to Downey (Rancho Los Amigos)…home of the first McDonalds and Bob’s Big Boy…much more of a challenge as he wouldn’t eat that institutional food, either and he weighed 129 lbs at 6’2″ Finally found Porto’s…motherload of decent sandwiches, etc (if you don’t go for their crazy delish sugary desserts). But it was fun to see the faces of the restaurant people when i would walk in and ask for their highest caloric meals…anathema in this town! Once home he was good…we grown our own for the most part and his dad is a great cook (not my strong suit)…plus lots of supplements and herbs…tho now he goes out to eat way too much…so i worry, of course! have you had any issues with pressure sores? he had the beginnings of one for the first time last week but seems to have nipped it in the bud. just got back from SF…went up for Outside Lands Fest..first trip since before the accident…had a BLAST!